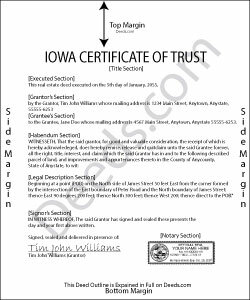 Under Iowa Code 633A.4604, the certification of trust is an official document confirming the terms of a trust as they relate to a specific transaction. Trustees wishing to enter into a transaction in the trust's name may be asked to present a certification of trust to prove the trust's existence and the trustee's authority to enter into the transaction. A certificate of trust presents the name and date of the trust under which the trustee is acting, as well as the identities of the trust's settlor and trustees. The document provides the name by which the trust will hold title to trust assets, and includes the trust's taxpayer identification number (TIN). If there is more than one trustee, the certificate identifies who has authority to sign documents relating to the trust and how many co-trustees are required to sign. The document also enumerates the trustee's powers relative to the transaction at hand, and includes the name of any person able to revoke the trust, if applicable. Like other documents affecting real property, the certificate should include the legal description of the subject property. Finally, the certificate requires statements that the trust has not been revoked, modified, or amended in any manner to cause the representations contained within to be incorrect; that the document is being signed by all acting trustees; and that the certificate is sworn and subscribed to under penalty of perjury before a notary public (Iowa Code 633A.4604(2)). The statements contained within the certificate may be relied on as if they were fact, but recipients of a certification of trust may request copies of the sections of the trust instrument designating the trustee and conferring the trustee's powers pursuant to Iowa Code 633A.4604(4). A recipient requesting the entire trust document may be liable for damages if a court finds they acted unreasonably in their request (Iowa Code 633A.4604(6)). Consult a lawyer with questions regarding trust law and certifications of trust, as each situation is unique.